Time flies when you're not paying attention! It's been 17 years since the first cabinet and press were dragged off the elevator on the fourth floor at 55 North Chicopee St. During all that time, 5,000+ type fonts, 400+ cabinets and over 300 machines and presses have come up and down that elevator. But the significant number (rough estimate over 4,000 to date) are the visitors from near and far who've walked up four flights of stairs to enjoy the ambiance, pick up supplies or find a treasure or two. It goes without saying the patronage is much appreciated. 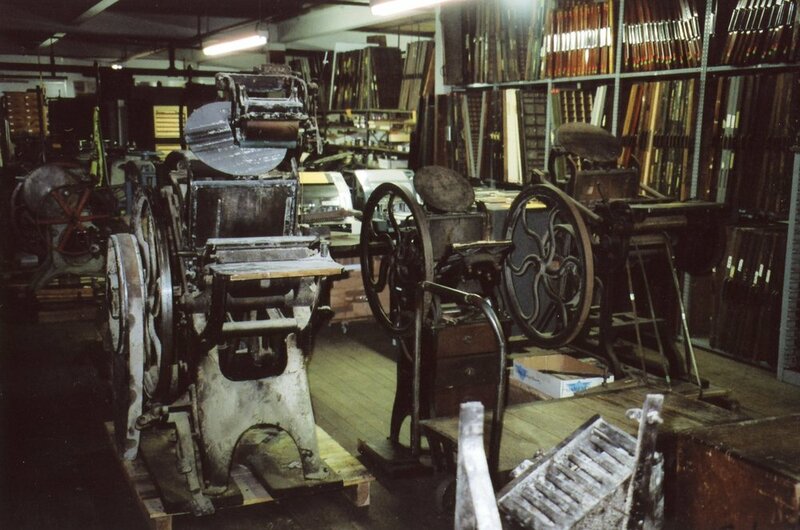 Those who have made the trek here know first-hand our passion and commitment to letterpress. Saturday, November 18th the store is open; just another open date (over 350 so far!) Nothing special planned. Well, there may be some cupcakes with 17 candles. What we'd really enjoy would be for lots of folks to come by, say hi, hangout and check out our new inventory. And promise, you won't have to sing "Happy Birthday."